On 15 June Professor Iván Martín, presented a study by the Migration Policy Centre on Exploring New Avenues for Legislation for Labour Migration to the European Union at the Committee on Civil Liberties, Justice and Home Affairs of the European Parliament (LIBE Committee). 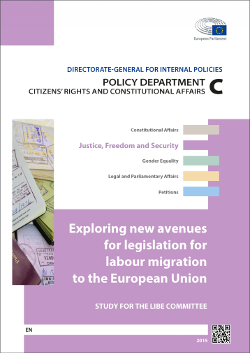 The Study, commissioned in 2015, provides a comprehensive analysis of EU labour migration policy, its development, its impact and future policy options. It was presented just after European Commissioner for Migration, Home Affairs and Citizenship, Dimitris Avramopoulos, presented the new European Commission’s proposals on legal migration published on the 7 June to the LIBE Committee . The MPC is currently carrying out another research paper to analyse that legal migration package. (study presentation started at 17:10).